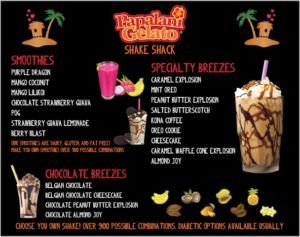 Introducing the Papalani Gelato Shake Shack! 100’s of smoothie options and almost 1000 milkshake options. Select one of our specialty drinks or make your own from our flavors of gelato and dairy-free gelato!